For the record, the brigade markings (on mudguards) are fictitious: I couldn't find much on the real thing outside of the Patton-equipped units, but wanted to add something nonetheless. 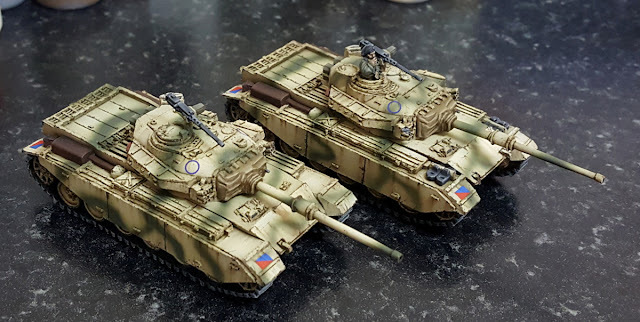 Most of the force I will do will be based on the Jordanian 40th Armoured Brigade equipped with M48 Pattons. However, with a few spare Centurion models I did a pair up as Jordanian vehicles; they are lovely tanks. 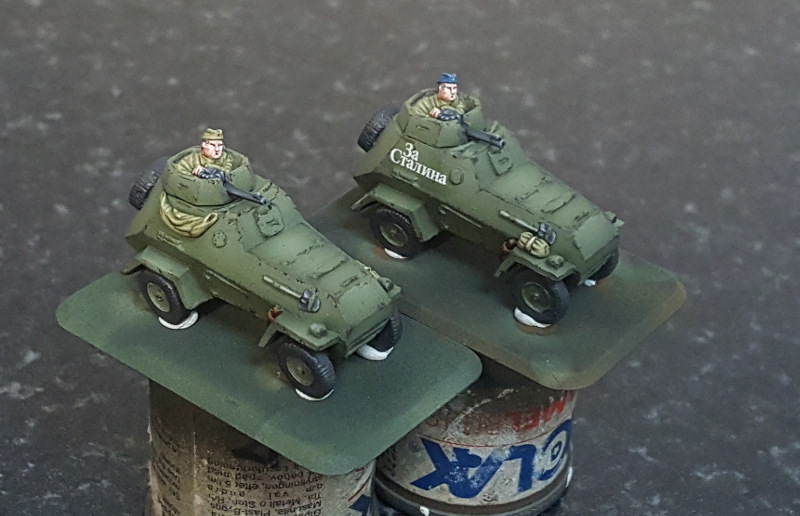 Battlefront BA-64 armoured cars, some recce for my BG Soviet forces. Base colours and ersatz modulation: AMMO 4BO set. (1) Very dark green, (2) MiG 932 4BO Base, (3) 1:1 mix of MiG 933 and 934 4BO colours. Below, a bit more work done applying decals, chipping, painting details, etc. One turret gunner was done with a blue pilotka in preparation for my Soviet Airborne project...at some point. Pin-wash and other finishing to do, but otherwise they've turning out nicely. 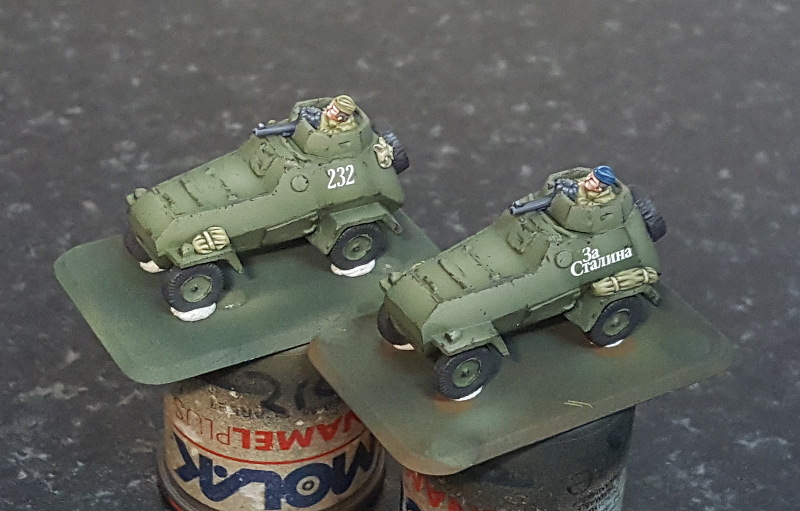 With two other models I'm considering doing them in whitewash for winter forces. Something I'll aim to do more regularly: work in progress posts of things I'm working on. 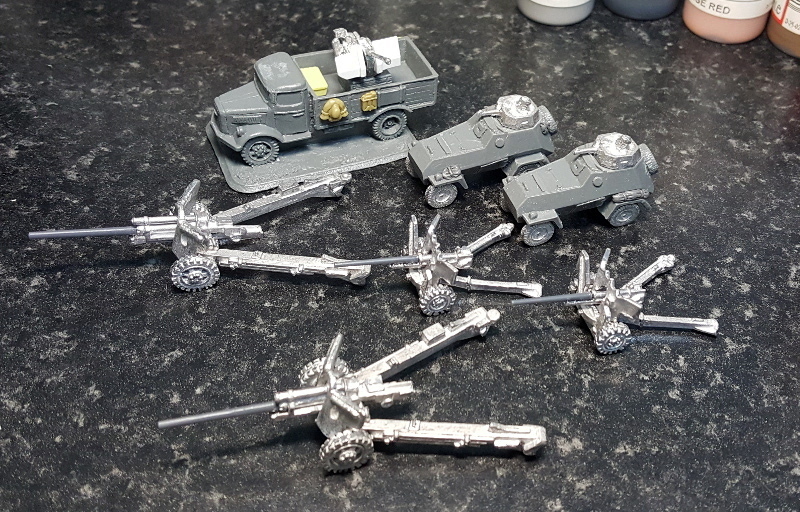 Here, a pair each of M1 57mm and M5 3" anti-tank guns for my Battlegroup US forces, plus a couple of BA-64s for my (long-delayed) Soviets. 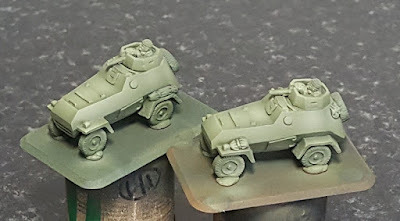 Also an Opel Blitz with 2cm Flak mounted, because I found I had one and in BG it will prove useful. Gun barrels on the ATGs were all replaced with plastic ones carefully cut and shaved to size. I also had to scratch-build a gun shield for the 2cm Flak that, given my poor scratch-building skills, did not come out too badly at all. I still have not found a decent source of replacement barrels for weapons such as the 2cm flak. The BA-64s will be painted first I think. 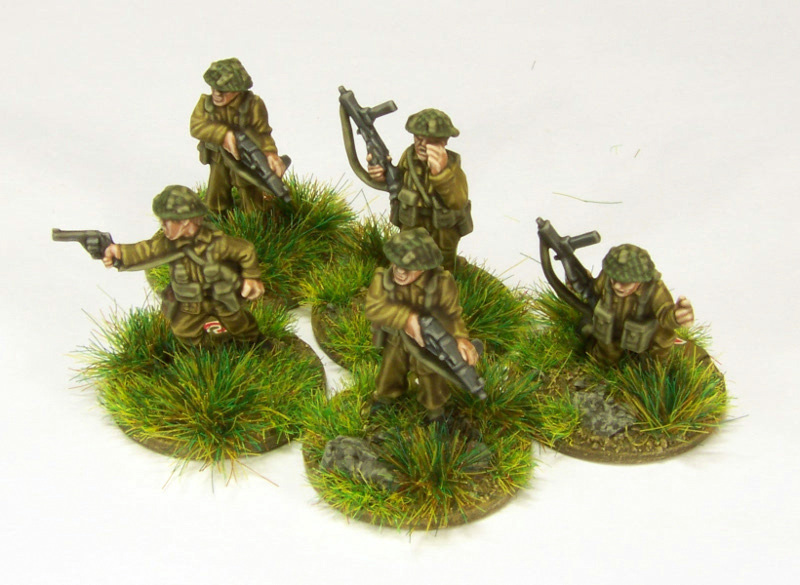 Schwere MG42 Platoon for GD Panzergrens. A few additions to the Grossdeutschland Panzergrenadiers I did a while back: a second platoon with command options, plus a few other teams. Quick jobs (for me....), gaming standard really, but good enough. 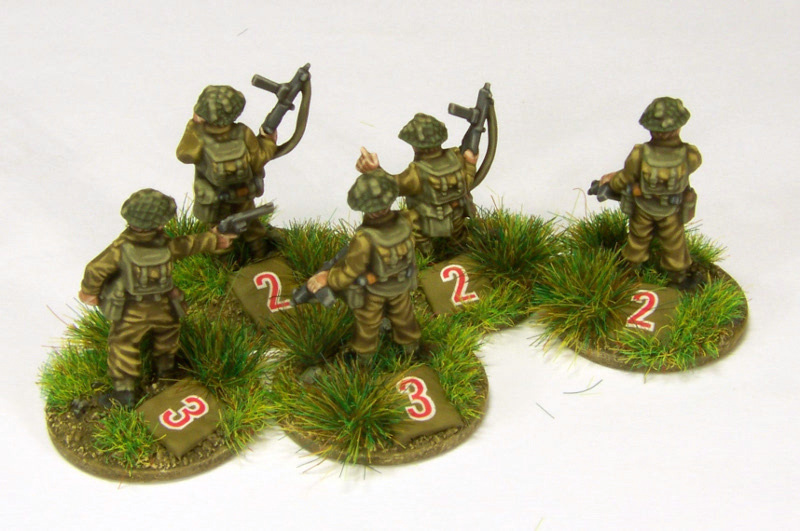 Based in pairs and singles for Battlegroup: 3x 10-man Rifle Sections, 5-man Command element, plus a pair each with the 2" Mortar and PIAT. 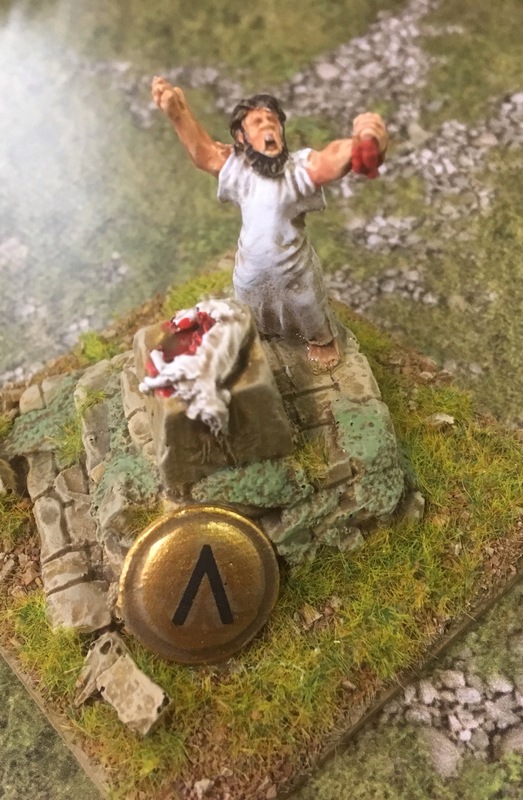 Later, I added some single commanders to act as leaders in Chain of Command: three Corporals, a platoon Sergeant and platoon Lieutenant. BF plastics this time as PSC does not give you nearly enough NCOs. On the whole, the BF Plastic British are a bit better than the PSC offering and, with extra NCOs, 2" Mortars, PIATs and a few spare riflemen and Brens, enough to add some useful support teams (e.g. the Universal Carrier dismounts), the BF box is the better buy IMO.